Dental Implants Brampton. Contact us today for an appointment! Dental implants are the best solution for replacing missing teeth and improving your smile at our Brampton dental office! Dental implants are the gold standard of care for replacing missing teeth. Whether you are missing one or several teeth, dental implants are a comfortable and attractive solution for tooth replacement compared to traditional bridges, partial or complete dentures. 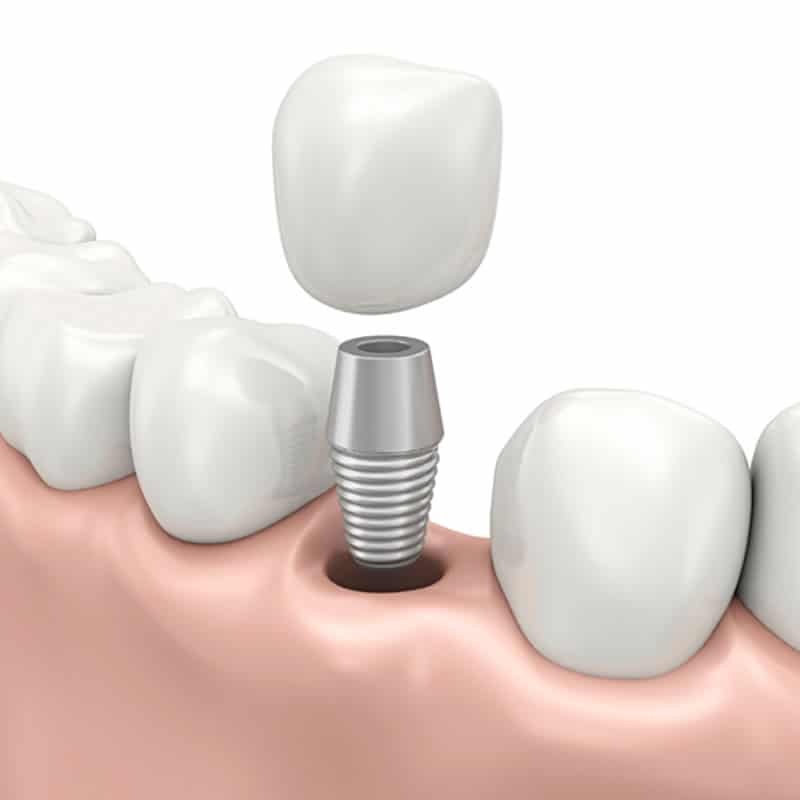 A dental implant is an artificial tooth root made of titanium metal that is surgically placed into your jawbone. Once in place, an artificial tooth replacement (crown or cap) is attached to the implant and looks like your natural teeth. Implants can also be used to better support and secure partial or complete dentures that were previously loose or ill-fitting. What is involved with dental implant treatment? At Northlake Dentistry, our office works closely with a team of certified specialists to achieve higher precision of customized care for our patients. During your initial consultation, a careful examination of your mouth and x-rays are completed to determine your options and if dental implants are the right solution for you. When starting dental implant treatment, our certified specialists will surgically place the dental implant into your jawbone below the gum tissue utilizing the most innovative and advanced technology in dentistry. During the healing period, as your tissues heal, the dental implant fuses to your bone. After this period, which varies depending on each patient case, a crown is secured to the dental implant and provides a beautiful solution to enhance your smile. There are many dental implant solutions available to you including implant bridges or implant-retained dentures that provide optimal esthetics and restore your speech and chewing function. If you are unhappy with your smile, tired of wearing loose dentures, or inquiring about replacing missing teeth, please call our Brampton office today to schedule a consultation. At Northlake Dentistry, Dr. Rachel Bell and her team take pride in the high level of quality care provided to all patients. We are dedicated to ensuring that your dental implant care improves your quality of life and gives you the confidence to smile again.